No photos please, not until my hair is done. When the Manolo Blahnik brand is attached, anything is glamorous, even cows. George Malkemus and Tony Yurgaitis own Manolo Blahnik USA and when their prized heifers hit the competition circuit, they are as runway-ready as the women who wear the couture shoes, Yankee Magazine reports. The process of getting the cows ready for judging is a little like the way the Project Runway models prep -- handlers at their Arethusa Farm in the Litchfield, Conn., hills paint the cows' hooves with clear nail polish and use hairspray to tease their tails. They also treat them to two heated showers per day and a blonding agent, like John Frieda shampoo, the Milwaukee Sentinel reported. When Vivian, a then 9-year-old Holstein was in her modeling prime in 2007, her handlers used Clairol Frost & Tip on her tail. Like the Manolo men did with their shoes, these fashion moguls took a simple idea and turned it into something much, much bigger. Back when Malkemus and Yurgaitis bought the farm in 1999, the plan was to start a small dairy farm and sell their bottled milk to the local community. But with Malkemus at the helm, you can’t expect average. After all, the once copywriter from Bergdorf Goodman’s marketing department is credited with turning Manolo into one of the most popular names in U.S. footwear. They invested in couture cows, and today, those high-end heifers are collecting the ribbons and drawing attention from some of the country’s most well-known socialites. Now, even designer Diane von Furstenberg has picked up cattle, theJournal Sentinel reported. Not only are their cows couture. 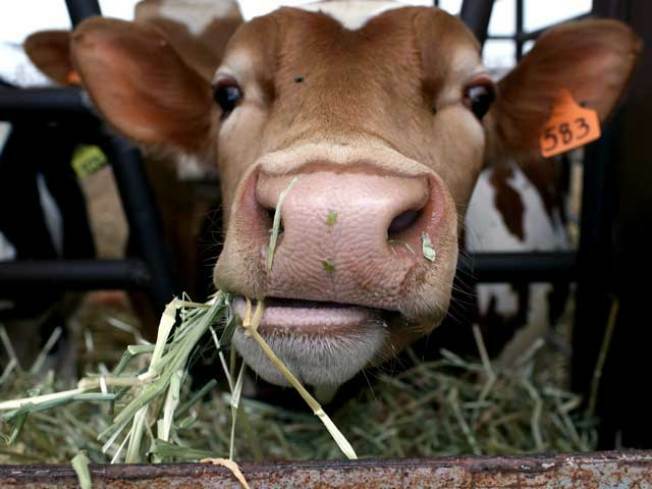 The farm's designer milk debuted across Connecticut in June, the New York Post reported. If you want to see the cows for yourself, the barns are open to the public on Saturdays from 1 to 3 p.m., at the Litchfield farm.